Is Project AirGig the solution to all our broadband woes? Could the answer to faster broadband be in the electricity power lines and pylons that already criss-cross the world? At Mobile World Congress last week all the talk was of 5G – the successor to 4G – but as a technical industry standard, 5G doesn't yet exist. Nobody knows for sure what 5G means, or even what it is, let alone how and when it's going to arrive. So engineers at telecoms giant AT&T have come up with another technology designed to bring faster broadband and better signal quality to millions of homes that survive on slow (or no) internet: using existing medium-voltage power lines to support millions of plastic antennas and devices to create superfast Wi-Fi everywhere, without the need for cables or cell towers. With trials due to start later in 2017, can AirGig live up to its nickname of 'wireless fibre'? AirGig is a broadband-over-power-lines (BPL) technology nicknamed 'wireless fibre' because its speeds are able to rival a fixed, physical fibre optic network. Although a new video doesn't give much away, the basics of AirGig are clear; this is not about using power lines as the network per se, but about putting radios on top of electricity pylons. Those radios will communicate with each other independent of the pylons, with signals travelling along or near the electricity cables – not physically through them – to create ultra-fast wireless connectivity for any home, or smartphone, along the way. Cue 4K mobile video streaming, even in the countryside. Low-cost plastic antennas and devices are placed on top of the poles or pylons to carry signals over long distances. As a general concept it's nothing new – BPL has been worked on for decades – but only now are wireless speeds fast enough for it to be worth considering. The 'missing link' is millimetre wave (mmWave) or extremely high frequency (EHF), an undeveloped (and unlicensed) band of spectrum ideal for high speed, point-to-point wireless networks, such as that proposed by AirGig. Engineers testing 5G networks are also using mmWave, which only works at short-range – ideal for producing a high-speed network around poles and pylons. 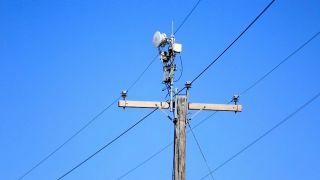 “There’s no direct electrical connection to the power line required,” explained Andre Fuetsch, president of AT&T Labs and Chief Technology Officer. “We’re experimenting with multiple ways to send a modulated radio signal around or near medium-voltage power lines.” Crucially, this is not just for broadband, but also mobile traffic. Fuetsch also explained how the radios that create multi-gigabit Wi-Fi signals are powered. “Power will be provided by inductive coupling, which uses the existing magnetic fields around power lines to provide power to Project AirGig equipment,” he said.